For more than 75 years, TEiC Heat Exchanger Services, a division of TEiC Construction Services and sister company of Thermal Engineering International (TEi) who designs and manufactures heat transfer equipment, has been installing, modifying and delivering high quality retube and repair services for a full range of heat transfer equipment products— regardless of make or model. We serve hundreds of electric utilities, combined cycle plants, and process industry customers in markets including pulp & paper, chemicals and refining and more. Expert 24/7/365 emergency repair assistance either on-site or in-shop by fully-trained and certified maintenance personnel is a specialty—no matter whose name is on the equipment nameplate. While there are many basic repair companies who can patch a blown tube, few have the experience and insight to figure out why such issues might be recurring. Our OEM experience allows us to get to the root cause of any heat exchanger repair challenge, and solve it for our customers, boosting efficiency and optimizing equipment longevity. Having performed hundreds of heat exchanger fabrications and installations, we’ve seen it all—and we have the expertise to fully diagnose the source of the issue, alleviate it, and help ensure peak performance and ongoing, trouble-free operation going forward. TEiC HX operates as a national company with strong regional focus. 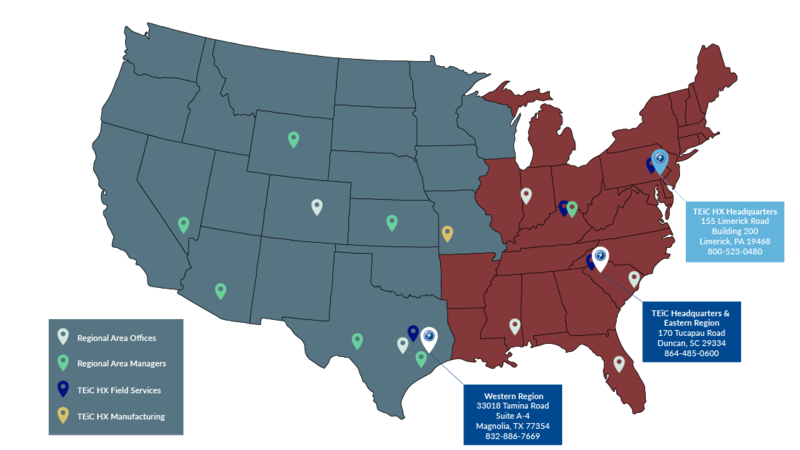 In conjunction with our sister company TEi, we have service centers and capabilities around the country, including Texas, Pennsylvania, Missouri, Kentucky, California and South Carolina, so we are always close by to most major industrial/power centers. You’re backed by the Substantial Resources of BPI. TEiC HX is part of Babcock Power Inc., an international company with multiple specialized business units all working independently and together as needed to best meet customer needs. For example, as noted, we often work in conjunction with our sister companies TEi and TEiC Construction Services, as well as do work on equipment featuring other high-quality Babcock nameplates such as Vogt and Struthers Wells.